Oh webos, we hardly knew ye. HP’s mobile era is over. 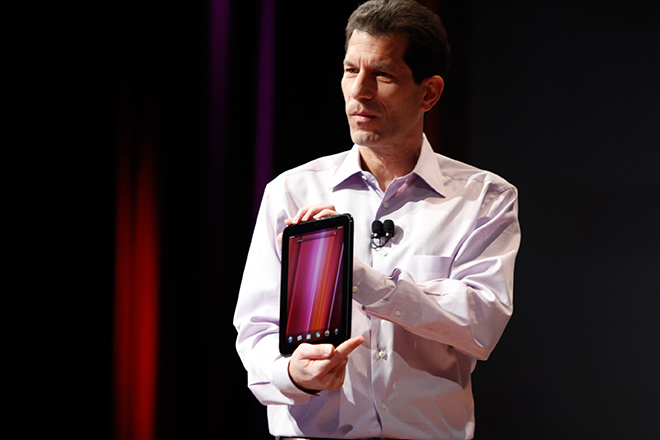 Jon Rubinstein, the HP executive to lead the charge against Apple’s iPad devices, has left the company as of Friday morning. A company spokesman confirmed to Wired in an interview that the mobile hardware guru, once a star at Palm when that company was still a contender, was no longer with Hewlett-Packard. To put things into even clearer perspective: The final nail in Palm’s coffin comes two years to the day after Steve Jobs announced the iPad. The end of Rubinstein’s tenure at the company marks the true end of the mobile hardware era at HP. After HP acquired Palm for its proprietary smartphone hardware and mobile software WebOS in 2010 for a cool $1.2 billion, Rubinstein and his all-star team of engineers made it clear that mobile would be the company’s top priority. Even through CEO shake-ups and internal strife, HP fully backed its dive into mobile, pouring resources and manpower into the massive undertaking. Rubinstein first made waves as a former Apple executive, the engineering brains behind two of the company’s most successful comeback devices: The candy-colored array of iMac desktops and the highly successful iPod. So Rubinstein’s move to Palm, in effect, was seen as a way to break out from under the shadow of Jobs and Ive, to create a successful product outside of Apple’s domineering grip on the smart device industry. Rubinstein spearheaded a push into creating an entirely new operating system for Palm devices with WebOS, and the introduction of Palm’s first smartphone to run the new OS, the Palm Pre. But Palm’s WebOS products underwent a series of stumbles upon its launch, as customers complained of hardware failures, software sluggishness and serious carrier problems with Sprint. Sales of the Pre and its brethren (the Pixi, among others) were lackluster and seen widely as a failure, unable to compete with RIM’s then dominant BlackBerry devices and Apple’s iPhone. Palm’s acquisition by HP was seen as a new beginning for Rubinstein and the company, a chance at relaunching the mobile hardware line with the full backing of a Silicon Valley giant. HP Would own the software and the hardware for its new line of smart devices, a strategy that worked successfully for both RIM and Apple in their respective mobile device initiatives. HP’s comeback device flopped famously, as the company under then CEO Leo Apotheker killed the hardware after a mere six weeks on the market. Reported sales were meager, and rumors of unsatisfied third-party retailers circulated as the TouchPad slunk to the graveyard of abandoned mobile devices. Continuing its abandonment of the mobile platform, HP announced it would open source its WebOS platform late last year, effectively diverting developer resources and commitment to the project and ending rumors of potentially licensing the software out for other companies to use. It was, in effect, a death sentence. As for Ruby’s future, the former exec hasn’t made it clear what he’ll work on next. In an interview with The Verge, Rubinstein said he was “going to take some well-deserved time off after four and a half years developing webOS,” signaling no immediate plans to move to another company. The news was first reported by technology blog AllthingsD.